An adorably fluffy romance that got me in the holiday spirit (in the middle of January) while making me laugh out loud. This is one of those books that I have been meaning to read forever, so when I got it for my birthday, I didn’t let it sit on my TBR shelf. I expected it to be a cute, ridiculous love story, and it was. I loved the premise of this book. Two teenagers united by a book of dares and a favorite bookstore? I’m in. And while the story takes place during Christmastime and is full of holiday cheer, I did not have any problem reading it in January. Dash was by far my favorite character. He’s an honest-to-God introvert, something that I don’t see a lot of in YA. And while he hated the idea of going to Macy’s two days before Christmas and genuinely loved being alone, he wasn’t cringey or awkward the way most introvert characters are. He’s wordy (which might come off to some readers as pretentious), but I loved it. Add in a whole lot of sass and there was no way I wouldn’t fall in love with Dash. I did not connect as directly to Lily, but I did enjoy her character. She was optimistic and energetic in an endearing way, but she also had her fair share of insecurities and frustrations. She wanted to be daring and ridiculous, but she also struggled to form friendships or break out of her comfort zone. I liked this take on extroversion—another character type that I haven’t read often. Parents played an interesting role in both characters’ stories. Neither set of parents is in town, or paying much attention to their children. The specifics of how each teenager accomplished this was a little ridiculous, but I rolled with it. Still, the parents affected Dash and Lily from afar, adding subplots and forcing their characters to develop, which I appreciated. Of course, the maybe-romance between Dash and Lily was the central focus of the book. The two of them bounce off each other for most of the book, interacting through the notebook while living their own lives separately. I enjoyed the way that the romance was handled in this book. Romance didn’t overpower the story, and it definitely wasn’t instalove, but it was there. Let’s be honest, if I left a notebook full of dares in a bookstore and a guy decided to take me up on it, I would spend a lot of time trying to figure out if he was someone I could date. And if I picked up said notebook, I would do the same. But while both Dash and Lily think about the possibility of their relationship, neither falls head-over-heels for the other, and both remain skeptical about the chances of a random passerby being The One. I loved the constant uncertainty of the romance. For most of the book, even I couldn’t decide if I thought they were meant for each other or if they should go their separate ways. This kept me reading more than instalove ever would have, and was another part of this book that I appreciated for breaking the contemporary romance mold. 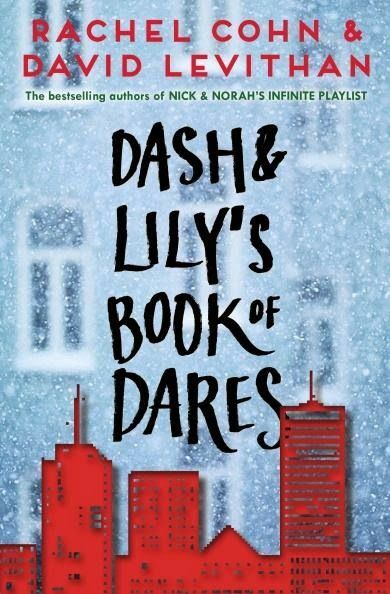 Dash and Lily’s Book of Dares was paced really well. There were enough subplots that I was always worried about what would happen next, but also enough lighthearted moments that I got the fluffy feels I wanted. The plot was not long or overly complex, but it was not so simple that I got bored. The story was filled with humor (some, but thankfully not all, cringe humor), literally making me laugh out loud—which I never do. Side characters make this book. None of them played major roles in the story, but all of them collectively made the book what it was. I loved the contrast between Lily’s massive family and Dash’s more reserved group of friends, as well as how both of those groups worked to bring the two of them together. On a side note, I loved this book for all of the LGBT+ side characters. While this book is definitely not Diverse™, it destroys the idea that a straight contemporary romance needs to exist in an entirely straight universe. It’s a small step in the right direction that made reading this fluffy book infinitely more enjoyable. I would recommend this book for anyone looking for a fluffy story that will make them smile. It is not a heart-wrenching romance, nor it is even a transformative book about self-discovery. It is simply a sweet book that has romance, self-discovery, and lots of allusions to authors and poets. I will definitely read Dash and Lily’s Twelve Days of Christmas, but I might wait for the 2017 holiday season. Problematic Moments: While DALBOD didn’t strike me as very problematic, is is not perfect. In one scene, Dash is really flippant about Hanukkah. Comment if you want more specifics.